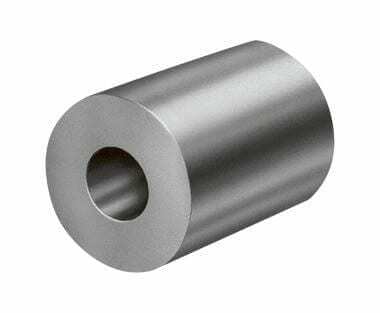 Round aluminium ferrules, crafted with quality aluminium, are best suited to use in conjunction with wire rope that has a tubular profile. They act as an effective end fastening that will not compromise the integrity of the underlying cabling. Order custom aluminium round ferrules from us and adjust your order accordingly. We produce ferrules of all shapes, sizes and materials, customised to each client’s requirements. Our round aluminium ferrules are especially popular, either acting as an end stop where a wire rope terminates, or sitting part way along the length of a cable to mark a specific point if needed. Pressed tight to the surface of the wire rope with great force, a round ferrule will be secure and resilient, offering plenty of strength and ensuring lifting safety standards are met. Aluminium is a sensible option for round ferrules, since it is widely available and eminently affordable. If you need a round ferrule of a specific size, we can produce it for you and even fix it to one of our custom wire rope assemblies. This bespoke service is a brilliant reason to buy from our site, since you can get exactly the kind of rope setup that is required. If you are unsure about any of the round ferrules we sell, or need guidance about any of the products on the Rope Services Direct site, get in touch. You can email us direct, or call 01384 78004 to speak to an expert for a speedy response. Round Aluminium Ferrules Overall rating: 5 out of 5 based on 6 reviews.